McKinnon’s 2000 acre operation is home to six poultry houses; five for pullets and one for roosters, each housing 10,000 to 14,000 birds. He raises the birds from 1 day old hatchlings to 22 week old breeders. The hens are then moved to a breeder farm to begin laying fertile eggs. 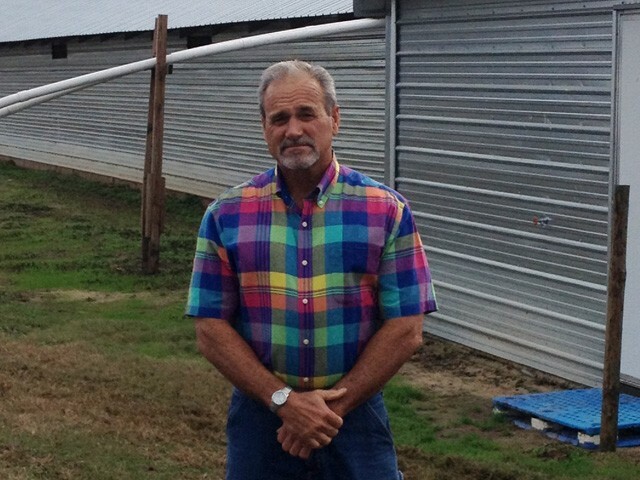 The history of Wayne McKinnon’s life in the poultry business begins at age eight. His first job was on his dad’s broiler farm, walking the houses, cleaning up, and checking the feeders every day after school. After 17 years of raising broilers, the family transitioned to laying pullets. Following the laying pullets, the McKinnons built houses that met the specifications for raising the pullets and cockerels they grow today. The upgrades have been a good investment. McKinnon’s flocks are ordered from breeder hatchers two years in advance. After the 22 week growing period, the pullets go to any number of growers in a fifty mile radius. Raising two flocks per year, with only a 2½ to 3 week gap for cleaning and sterilizing in between flocks, the work is steady. McKinnon is very appreciative of his workforce, which includes Lucas Rodriguez, an employee with McKinnon Farms for 25 years. In addition to Rodriguez, McKinnon employs two more full time employees, four hourly employees, plus 20 to 25 on the payroll for about 120 days during harvest. “If we didn’t have a good workforce, we wouldn’t have the success we have had,” states McKinnon. McKinnon is a “third generation farmer. I worked with his dad before he retired, too,” reports Flock Supervisor Duncan. Wayne’s son, Clay McKinnon, age 21, will become Wayne’s full time partner on the farm once he finishes his education. Wayne’s daughters, Amanda and Monica, grew up on the farm and are still close by. Wayne’s wife, Lynn, manages the McKinnon Farms’ books and payroll, rounding out the McKinnon family farming tradition. Wayne is also an involved community member. He serves on the bank board at Sun Trust Bank and meets with the Georgia Tobacco Commission every 60 days. McKinnon has even turned his hobby of being a pilot into a way to serve the community, as a member of the Airport Commission Board, which manages the airport.